This is another book I haven’t actually read the prequel to, but there were hints and mentions about Gretchen and Daniel’s past that enabled me to understand a lot of what had gone on before. It was interesting to see Gretchen’s opinion on Hitler, as someone who had been close to him and then realised what he really was. I also found it intriguing to see her and Daniel in England, trying to tell politicians there of what was going on in Germany… only to be ignored because no one wanted to hear. I also found it quite interesting to learn more about the historical characters. Even though Hitler’s followers were evil, it was interesting to see that some of them came across as a bit more well-rounded. I found myself intrigued by the character of Eva and Gretchen’s obvious history with her. One of the aspects about this book that I particularly liked was the fact that it was made clear the relationship between Gretchen and Daniel wasn’t perfect. They quite clearly loved each other, but it was good to see them talk about and accept the fact that both of them needed different things. 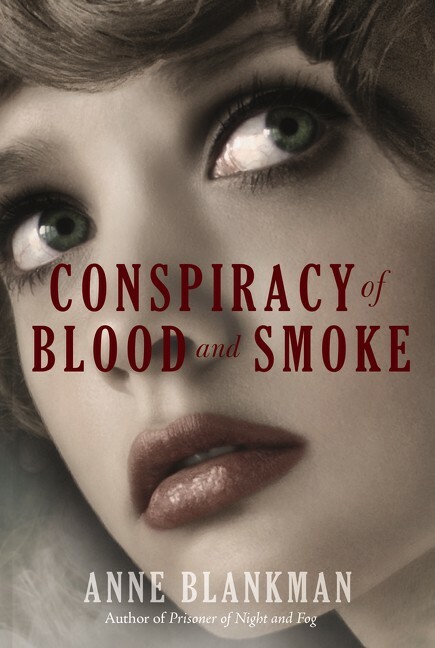 The atmosphere of this book was really intense throughout and I did feel it was well-researched. I also thought that the actions of the characters made sense with who they were… and it was really good to see that there were people fighting back in Germany. I did feel some sympathy towards Gretchen’s brother, having found out what his childhood was like… but from what I learned of him, he was still an awful person and I agreed with Daniel about how Gretchen’s father’s actions couldn’t be entirely blamed for what her brother became… even if he was clearly at least partially responsible. I found a lot of the supporting characters to be interesting and they were ones I would like to see more of. At some time in the future, I would like to read the book that preceded this one… and I would certainly be interested in reading a book that follows on from this one. “We must get out of here immediately,” Daniel interrupted, seizing Gretchen’s hand. He pulled her out of the office. Somewhere she heard the creaking sound again, but close enough this time that she recognized it–a floorboard whining under someone’s weight. They raced into the parlor just as the unmistakable pop and fizzle of gas lights flaring into life sounded from the front hall. As a yellow glow flickered and grew, a black shape dashed through the entryway straight toward them. Gretchen stumbled backward, her heart surging into her hart. Nearby, she heard Daniel cursing and wrenching the pick free from the lock. The shape flew at them, sharpening into the bone-thin, black-dressed figure of Frau Fleischer. She carried an ancient-looking shotgun. Gretchen let out a harsh cry as the landlady swung the weapon up and jammed it against her forehead. Then he kissed her. His lips on hers were as light as a breath. And she couldn’t stop the horrible thought that his touch felt like a farewell. 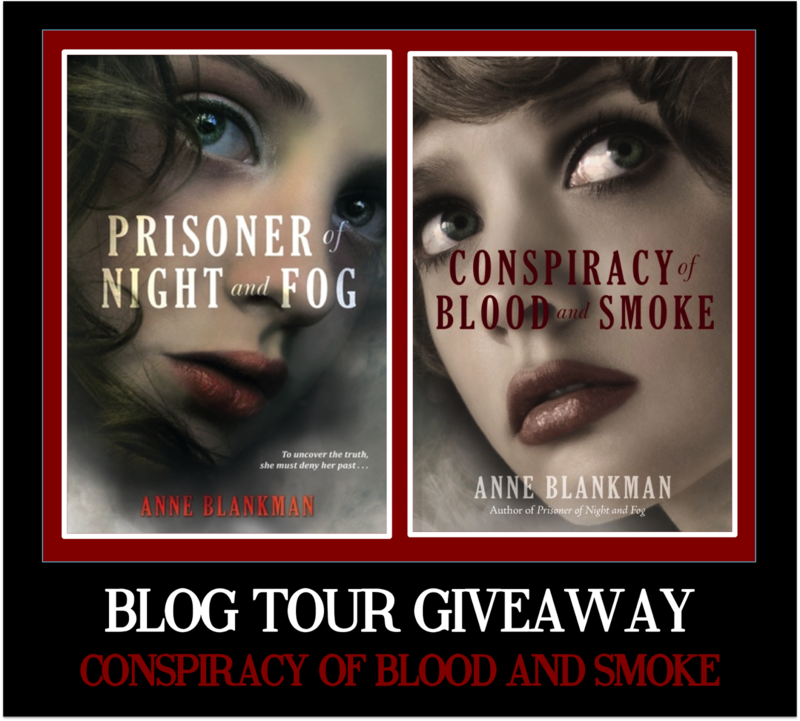 Follow the Conspiracy of Blood and Smoke Blog Tour and don’t miss anything! Click on the banner to see the tour schedule. 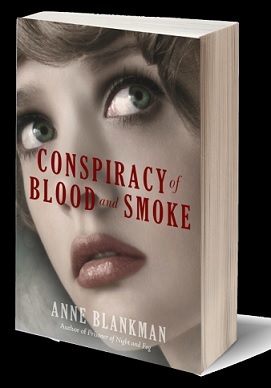 Anne Blankman may have been meant to be a writer because her parents named her for Anne of Green Gables. She grew up in an old house with gables (gray, unfortunately) in upstate New York. When she wasn’t writing or reading, she was rowing on the crew team, taking ballet lessons, fencing and swimming. She graduated from Union College with degrees in English and history, which comes in handy when she writes historical fiction.After earning a master’s degree in information science, Anne began working as a youth services librarian. Currently, she lives in southeastern Virginia with her family. When she’s not writing young adult fiction, she’s playing with her daughter, training for races with her husband, working at her amazing library branch, learning to knit (badly), and reading. 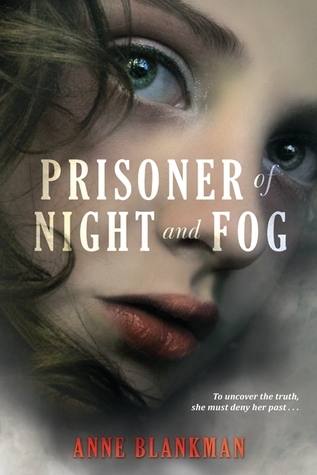 Anne Blankman is the author of PRISONER OF NIGHT AND FOG, the first in a three-book deal slated for publication in spring 2014 from Balzer + Bray | HarperCollins. She is represented by Tracey Adams of Adams Literary.